I'm a Visiting Lecturer at The Heatherley School of Art and in two weeks time I'm going to be giving a talk there about the Do's and Don'ts When Writing an Artists Statement and C.V.
How to interest people in what you do – and why people stop reading! Here are the details of where the talk is. 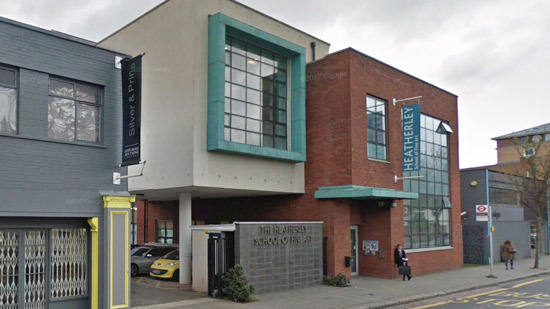 Venue: The Heatherley School of Art. Consult this page to see where they are on a map and how to get there via public transport. You don't have to be a student at Heatherley's to attend the talk but you can't book a seat. My first talk How to get on - online was very popular, so I'd recommend getting there in good time as this talk is a "by request from the students" topic and is also the topic which gets the most traffic on my website! For those who can't get there, I'll also upload the synopsis to my Art Business Info. for Artists website after the talk - and will let you know when I've done this. Do also keep an eye on the events page at Heatherley School of Art - as they have a number of interesting speakers during the course of the academic year. You can also find details of the various full-time and part-time (day and/or evening) courses on offer at the School on its website. Posted by Making A Mark on Tuesday, October 31, 2017 4 comments Who's linking to this post? Posted by Making A Mark on Monday, October 30, 2017 2 comments Who's linking to this post? 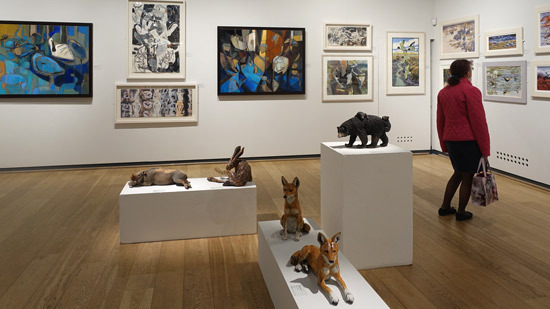 The Natural Eye exhibition at the Mall Galleries finished at lunchtime today. If you aspire to submit your work and get selected next year - read on! I've had various conversations with the President Harriet Mead over the years about what they look for in terms of the open submission. We also had a long chat on the phone after I'd seen the show as I wanted to be clear how the selection process works and also what sort of criteria are employed in selecting artwork. Posted by Making A Mark on Sunday, October 29, 2017 10 comments Who's linking to this post? a man-about-town known from the galleries of Manhattan to the Art Basel fair in Switzerland for his primary-colored suits and deep connections in the industry. 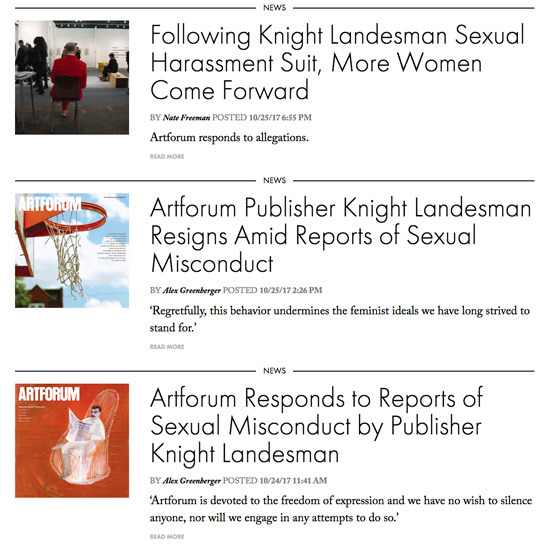 Below are links to the newspaper articles which this week closely followed the accusations of alleged misbehaviour - after a complaint was filed in the Supreme Court of the State of New York accusing former Artforum publisher Knight Landesman of years of sexual harassment. It's been difficult keeping up with who said what and when! Posted by Making A Mark on Saturday, October 28, 2017 0 comments Who's linking to this post? 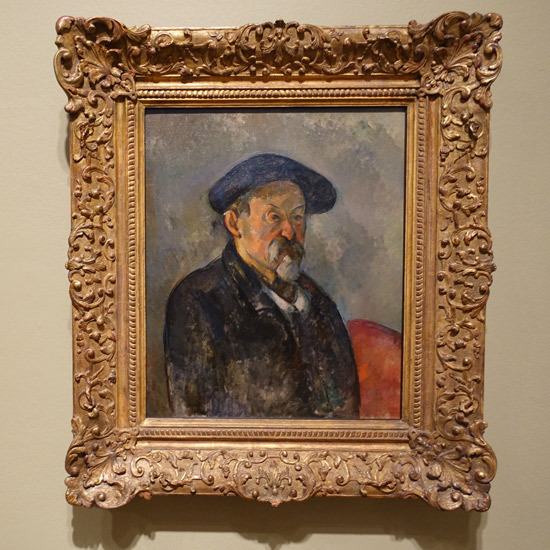 I recommend you see the new Cezanne Portraits exhibition at the National Portrait Gallery if you can. I wasn't expecting to like it as much as I did. over 50 of his portraits have been gathered together for exhibition in one place. his portraits have been seriously exhibited since he died and the retrospective in the Paris Salon d’Automne of 1907, the year after his death which influenced both Henri Matisse and Pablo Picasso, amongst others. It's also a splendid and significant exhibition occupying almost all of the ground floor exhibition space at the National Portrait Gallery - the same space occupied by the exhibitions for the Lucian Freud retrospective and Picasso's Portraits. Interestingly, it opens in London 111 years - almost to the day - after he died in 1906. The exhibition opened to the public at the NPG today and continues until 11 February 2018. So lots of time to see it - however this one is undoubtedly going to be a blockbuster (see below) - so don't hang around to book tickets. I saw it twice yesterday - in the morning at the PV and then again in the afternoon at the Friends Preview - which was packed. The morning was a briefing. I listened to Nicholas Cullinan tell how this exhibition started out some six years ago during the tenure of his predecessor Sandy Nairne. Then listened to the curator of the exhibition, John Elderfield, provided an excellent tour and explanation of the exhibition. (He's the Chief Curator Emeritus of Painting and Sculpture at the Museum of Modern Art, New York, following his tenure from 2003 to 2008. He's also now the Adler Distinguished Curator of European Art and Lecturer 19th- and 20th-Century European Art at Princeton). give a sense of progression in Cezanne's painting processes from beginning to end. models at the beginning are largely family, lovers and very close friends. Towards the end of his life he paints people around where he lives in Provence. His wife and son by this stage are living in Paris. Posted by Making A Mark on Thursday, October 26, 2017 2 comments Who's linking to this post? 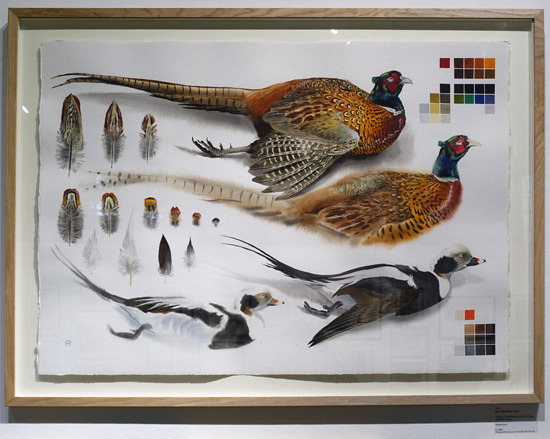 One of the things which struck me when viewing "The Natural Eye 2017" exhibition of wildlife art is how exciting, vibrant and thoroughly stimulating the ART is - never mind the subject matter. which contained coastline and wildlife I know well! Wildlife might be the subject and the focus - but what interests my eye is the sheer variety and exciting use of media, styles, approaches and techniques plus the quality of execution in the various ways of making art! It's an exhibition I always look forward to and it very rarely disappoints. It certainly lives up to its usual high standards this year. Part of the exhibition in the Threadneedle Space. I don't always feel the same way at every exhibition I visit at the Mall Galleries. 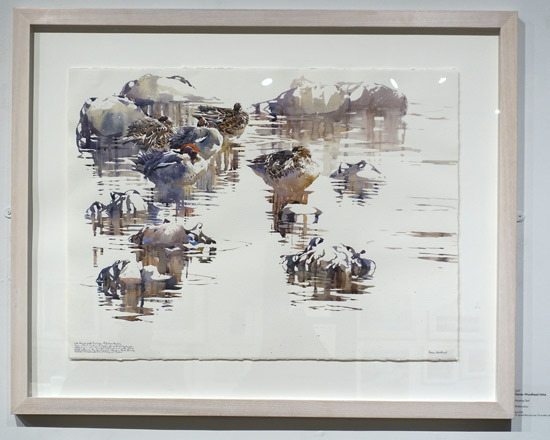 It also occurred to me that it might be very educational for some of the members of the other FBA societies to take a look at the annual education of the Society of Wildlife Artists (SWLA)- even if wildlife art is "not their thing". 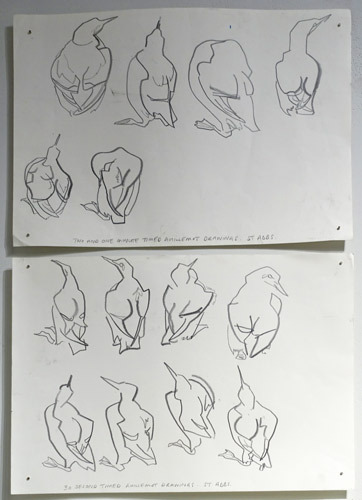 VIDEO: Wildlife Field Study sketches by the SWLA in the projects part of the exhibition (in the North Galleries). If this is the first post you've read, be aware there's lots more images in these two posts! and will also include a count of the number of works by members, associates and non-members. What did I notice this year? how subtle shades and colours occur where wildlife merges with its habitat. 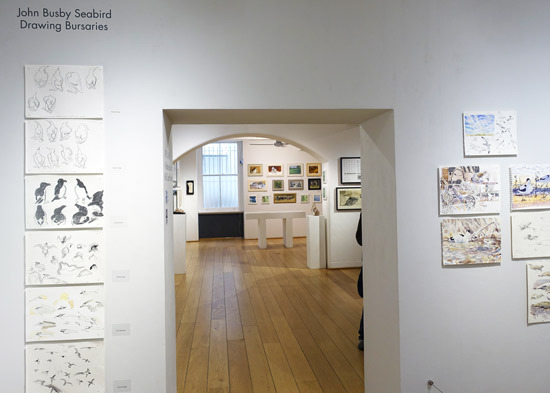 I thought the exhibition looked a bit more "birdy" than usual this year - but I've had an explanation which makes sense to me. It was pointed out that, in terms of wildlife which stays in one place - albeit it might be coming and going, birds are pretty reliable at "turning up" and "staying around" if you know where to go and where to look. Thus you might have a moving target - but it's often one which stays in full view. As always with wildlife where artwork is NOT produced from photos, you also need a very good set of binoculars or telescope for seeing your subject matter from a distance which means they behave naturally. It's always interesting in this exhibition to see both the sketches, sketchbooks and the study sheets. There were some great images and various styles in terms of those exhibiting studies. The sculpture is, as always, diverse and excellent. I think it's the first time I've seen a bear with cubs and I'm also pretty sure it's the first time I've seen a Pangolin. What I enjoy is the natural look of the 3D subject matter. Some of the watercolour painting is top quality. I'm always hugely impressed with whatever Darren Woodhead produces. It's as if he's always challenging himself on a "less is more" dimension - and just how little paint he needs to use to create the painting he wants to make. The fact that he creates all his paintings 'in the field' makes them all the more impressive! I adore watercolours where there is no light edge, it's suggested through the quality of the design and composition and what gets painted and what gets left. His watercolour paintings are almost minimalist in a zen like way. A Graduate of the Royal College of Art, he works direct in brush and watercolour outside: there is no studio. The printmaking on display is various, numerous and absolutely first class - at every level in terms of technique and size. 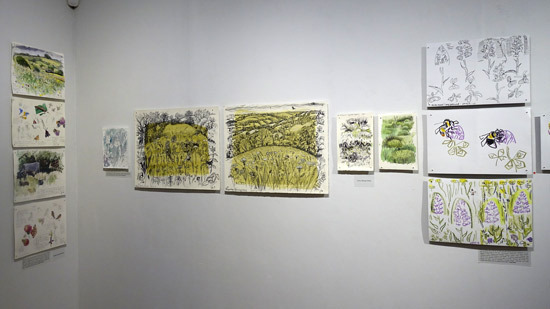 There seems to be every sort of fine art printmaking on display somewhere in the gallery. Max Angus SWLA - the hare and redwings - who explains the process for her linocut of a hare on her website. Her prints are pressed on Hettie which is "an original 1859 Henry Watts Albion Press, Patent number 937". I like the fact she also identifies where she saw the subject of her print on her website! Little grebes, also known as Dabchicks, move from the sea-lochans onto fresh water to breed. In summer I heard their high wickering call, but they never let me approach very close. They were diving for small fish to feed their chicks, whilst damselflies skimmed above the waterlilies. 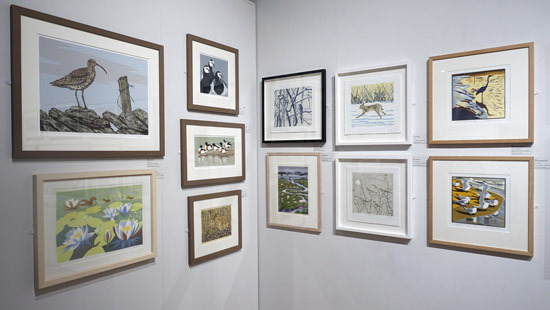 The small wall of prints - on the left as you walk into the North Gallery is particularly noteworthy. 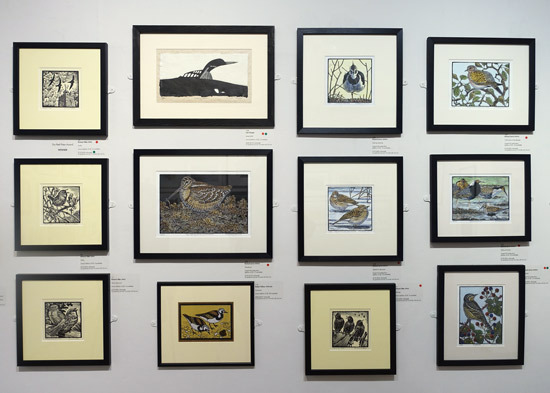 I particularly liked the bird prints by Richard Allen SWLA (a woodcutter) and Richard Jarvis ASWLA (linocutter). The later explains on his website about how he approaches linocuts and printmaking - which, of course, starts with sketches. The prints did make me wonder if artists had had a discussion about the best prices for smaller works as there seemed to be a sense of agreement between artists as to how to pitch prices relative to size. That might of course have developed from knowing a lot about how to get the pricing right! 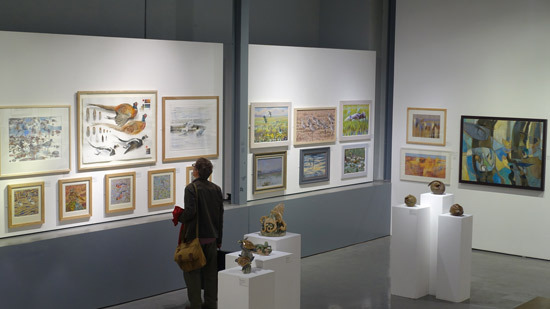 Most of the exhibition is given over to native animals and birds - and those that visit these Isles. Although the Society boasts international members and some certainly travel for their art, there's very little by way of what people might conventionally think of as wildlife i.e. lions, tigers and elephants. very little that's bashful and lots that shout "look at me". That's not to say they're loud. It's just that they're not in any way weak or backward about coming forward. lots of red spots (sales) and green spots (unframed prints) - these are achieved not just because wildlife art has a big fan base but also because the artwork is excellent. very British! Lots of native and indigenous animals as well as the regular visitors! Tomorrow - the sort of artwork that gets selected and how to help your chances! 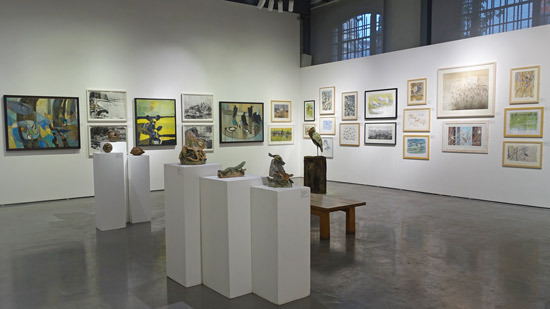 One of the things I like about this exhibition is that it takes over the entire gallery - and then uses the two far galleries in the North Galleries to exhibit sketchwork and drawings done plein air as part of projects. enabling others to develop their skills and become used to drawing wildlife in the field! Posted by Making A Mark on Tuesday, October 24, 2017 1 comments Who's linking to this post? For more about each of these places/projects click the links above. 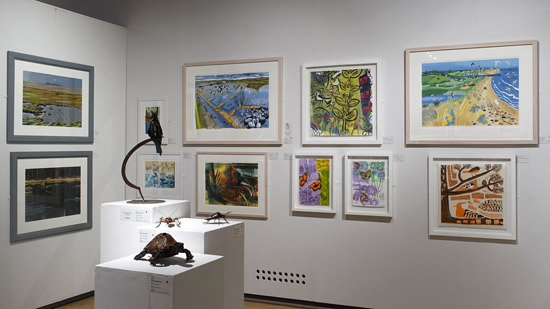 The sketches are being displayed in the North Galleries of the Annual Exhibition of the Society of Wildlife Artists at the Mall Galleries - which runs until 1pm on Sunday 29th October. 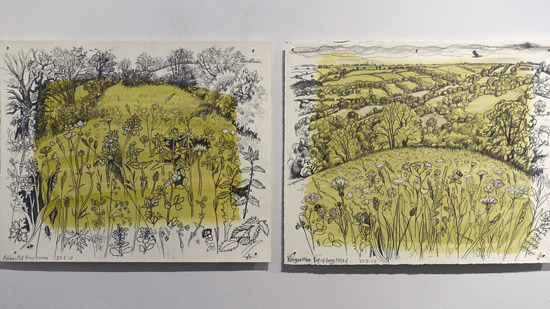 Given my personal preference for botanical subject matter it's unsurprising that I was particularly taken by Carry Akroyd's sketches of the Kingscombe Meadows. My review of the exhibition - which is taking a bit longer than anticipated - follows tomorrow. Posted by Making A Mark on Monday, October 23, 2017 0 comments Who's linking to this post? I went to see The Natural Eye 2017 on Friday. 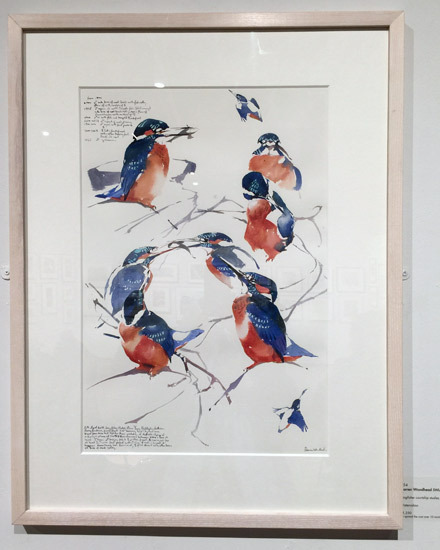 This is the annual exhibition of the Society of Wildlife Artists yesterday and I'll be writing my review of this splendid exhibition tomorrow. 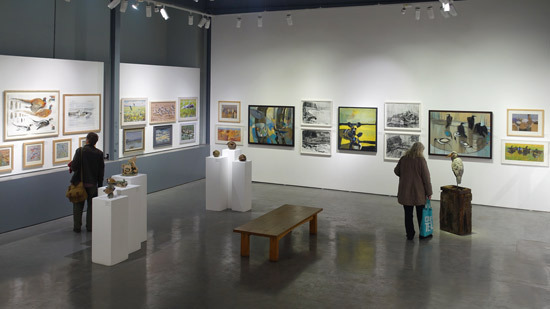 on the Mall Galleries website - click the link above and scroll down. If you're interested in buying work via the website just complete form to the right of the artwork to enquire whether it is still available. in the online catalogue on Issuu (which you can download if you have an Issuu account) - very useful for checking pricing if you intend submitting in the future exhibitions! Today I'm going to highlight those artists who received awards. 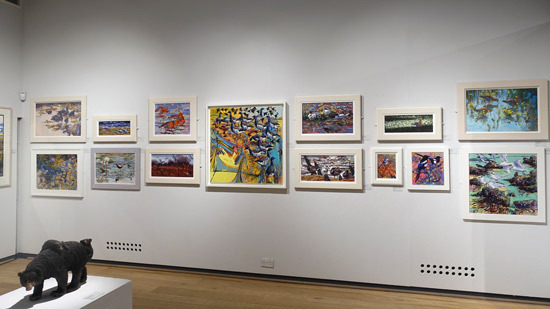 Links in the titles of the work are to that work on the Mall Galleries website or the website of the artist. 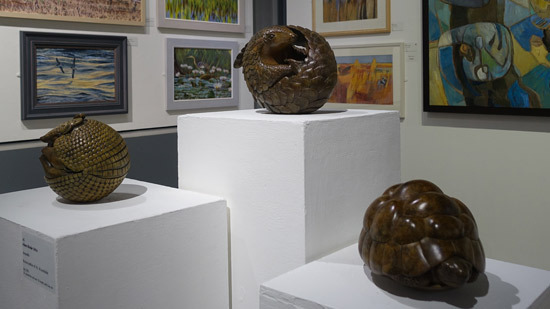 The exhibition was opened by David Lindo (aka The Urban Birder)- broadcaster, presenter on @BBCRadio4 Open Country, writer, author, talker and bird guider - who also presented the awards. 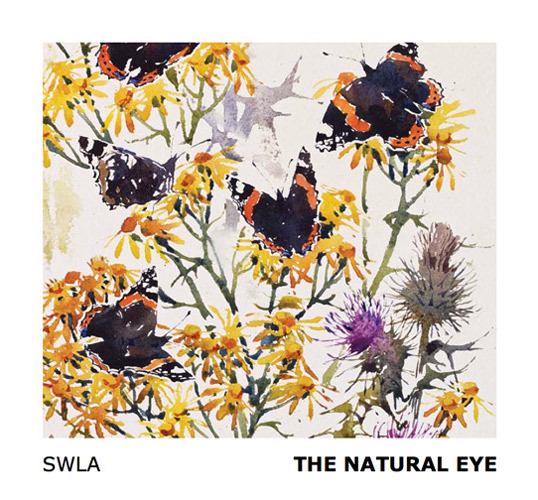 This prestigious award, held in association with the Society of Wildlife Artists (SWLA) and Swarovski Optik, is given to the artist whose work at the SWLA’s annual exhibition The Natural Eye is considered to be the most outstanding. You can see more of the work Nick is exhibiting this year on his website. Passionate about wildlife art since childhood, Nick took his first sketchbook out into the field when he was 13 years old in order to record his first Bittern. Since then, he has learned to draw and paint a bit better (most of the time), won a good few awards, assisted in illustrating several publications, become a member of the SWLA and sketched more than one Jack Snipe. The Terravesta Prize is a new prize this year sponsored by Terravesta, pioneers of sustainable energy from Miscanthus, who are also sponsoring the exhibition as a whole. The artwork was chosen by William Cracroft-Eley the Chairman of Terravesta, who greatly enjoyed the exhibition and stayed for most of the day! 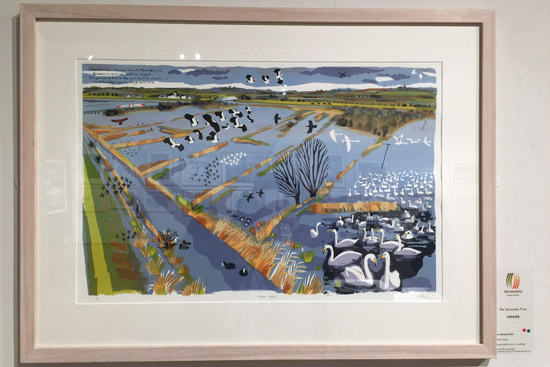 Flooded Washes by Carry Akroyd SWLA (Twitter) won this new prize and was selected because it was strong on habitat as well as wildlife - and excellent art of course! 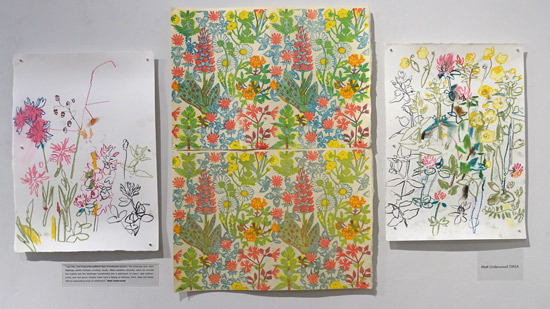 Carry is both a painter and printmaker and specialises in serigraph printing - which is the term used for screen printing when it is fine art rather than commercial art. 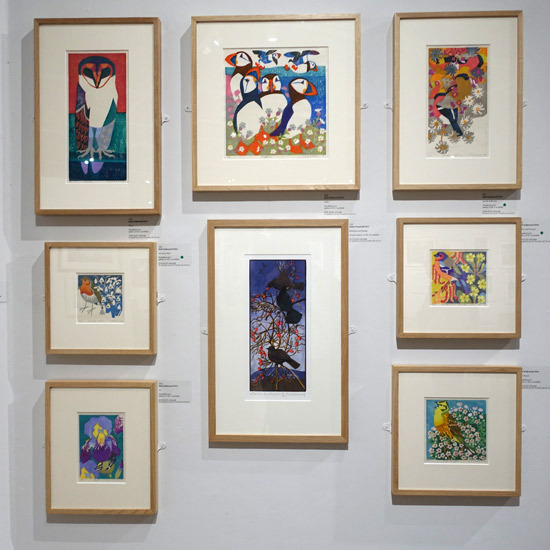 However she also produces monoprints, etchings, linocuts and lithographs. 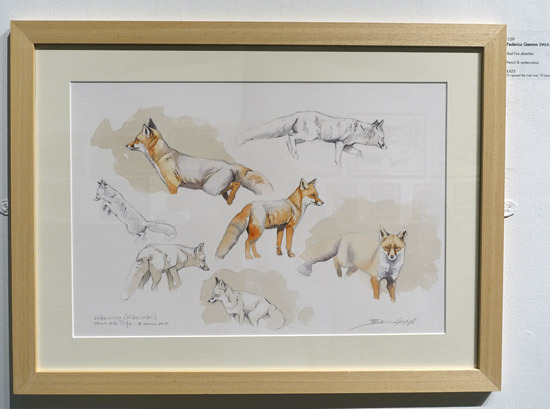 You can also see her art in Found in the Fields - an article on the BBC Wildlife Magazine which focuses on how she finds wildlife on the margins of agribusiness. She is also the President of the John Clare Society - who was also concerned about the impact of commercial agriculture on the countryside. She seems a very fitting choice for this new prize. 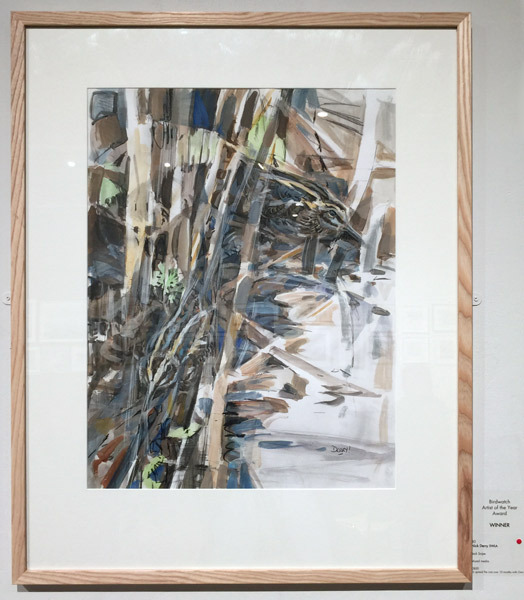 The RSPB Award went to Dafila Scott SWLA for her pastel drawing of a Bittern over the fen which highlighted this wading bird in flight. Posted by Making A Mark on Sunday, October 22, 2017 2 comments Who's linking to this post? 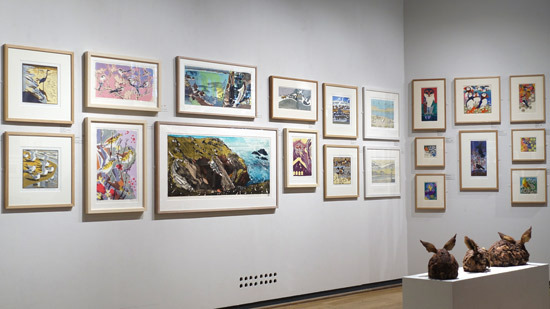 The collectable art and artifacts from Howard Hodgkin's estate are being auctioned on Tuesday at Sotheby's in London. You can view the exhibition on Sunday and Monday - and it has some really lovely things in it. 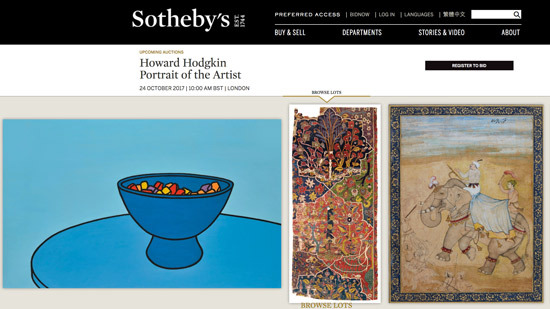 You can also see the items online at the Sotheby's website for Howard Hodgkin Portrait of the Artist. It's also intriguing how somebody known for his contemporary art should collect so much very traditional and decorative art. The Indian pieces are outstanding! Plus do read his article How to be an artist - it's a RECOMMENDED READ. Posted by Making A Mark on Saturday, October 21, 2017 0 comments Who's linking to this post? I'm developing a new section within Art Business Info. for Artists in relation to Practice - How to be a successful artist - Habits, Practices and Development. 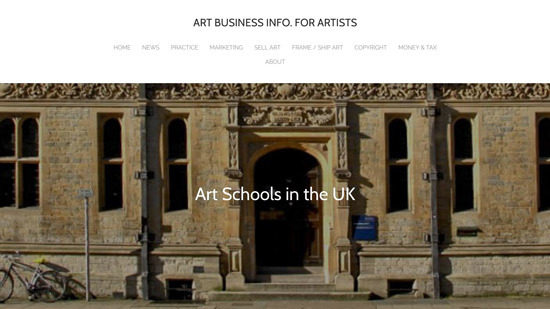 One of the new pages in the sub-section that relates to Learning for Artists is about Art Schools in the UK. Are you interested in doing a fine art course? Are you trying to decide which art school to apply to? Do you know what your choice is if you want to do an undergraduate degree or postgraduate course in art and/or design? Applications for a place to pursue an art degree in the 2018 academic year are now over. However it's never too early to start looking if you're thinking of applying for a place in the future. Posted by Making A Mark on Friday, October 20, 2017 0 comments Who's linking to this post? Jean-Michel Basquiat (1960-1988) was a precocious and highly original talent - as a poet, artist and social commentator. He lived fast, painted faster, made a lot of money and died young, age 27, of a heroin overdose - just over 30 years ago. In May this year he achieved iconic art star status. an exhibition at the Barbican. Jean-Michel Basquiat: From homeless to $110m artist - covering the development of the artist through to the sale at Sotheby's. "Basquiat - Rage to Riches"
I knew very little about Basquiat before watching the programme the Basquiat - Rags to Riches programme (link above) - but found it enormously interesting and a very good programme / bio about the artist. It's an interesting mix of the people who knew him really well as friends and those who knew him once he became absorbed by the art world - such as Larry Gagosian. 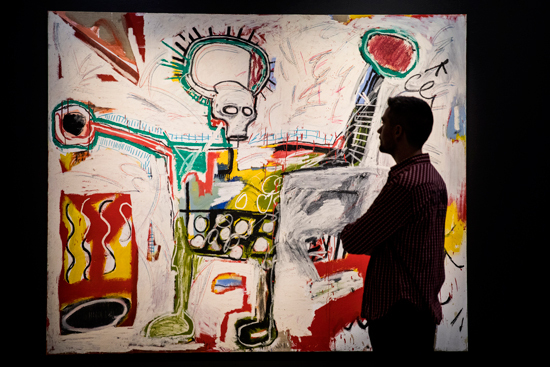 The recent Sotheby's auction of a Jean-Michel Basquiat Skull painting for over a hundred million dollars has catapulted this Brooklyn-born artist into the top tier of the international art market, joining the ranks of Picasso, de Kooning and Francis Bacon. This film tells Jean-Michel's story through exclusive interviews with his two sisters Lisane and Jeanine, who have never before agreed to be interviewed for a TV documentary. With striking candour, Basquiat's art dealers - including Larry Gagosian, Mary Boone and Bruno Bischofberger - as well as his most intimate friends, lovers and fellow artists, expose the cash, the drugs and the pernicious racism which Basquiat confronted on a daily basis. As historical tableaux, visual diaries of defiance or surfaces covered with hidden meanings, Basquiat's art remains the beating heart of this story. 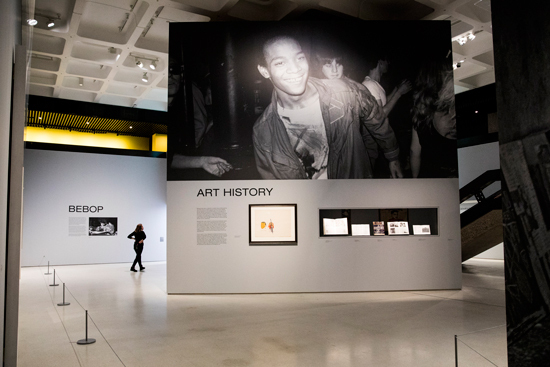 Basquiat at the Barbican: "Basquiat: Boom for Real"
Posted by Making A Mark on Thursday, October 19, 2017 2 comments Who's linking to this post? However the BIG story is the backstory about how the portrait came to be entered for the competition in the first place - which makes for fascinating reading. I'm guessing the sentiments expressed will be ones that many artists will have known at some point in their career. 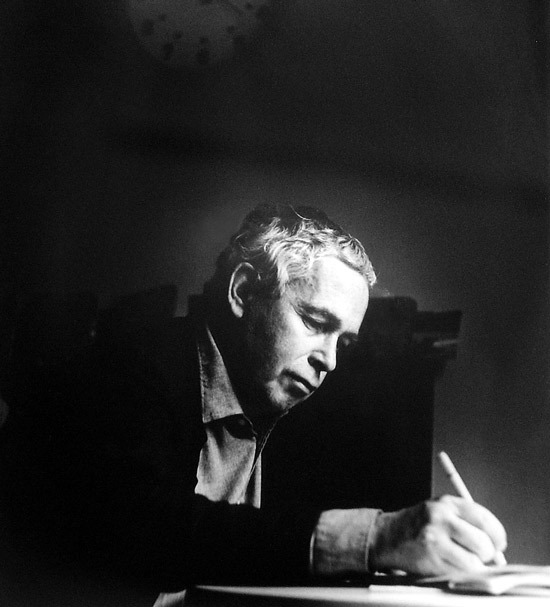 both excellence and creativity in contemporary Australian portraiture by asking artists to interpret the look and personality of a chosen sitter, either unknown or well known. Greta Moran - a founding Director of the Moran Arts Foundation which she established with her late husband Doug Moran in 1988. Tim Storrier's portrait of his friend the artist McLean Edwards is to my mind the absolute stand out portrait amongst the finalists - it's head and shoulders above the others - in more ways than one. (notwithstanding the fact the finalists included a self-portrait by McLean Edwards). “went outside his personal mythology and produced an affectionate, teasing, ‘friendship painting’ of a wild fellow artist”. this is the first time Tim Storrier has entered the Doug Moran Portrait Prize competition. Storrier was also in the news earlier this year for blasting the choice of winner for The Archibald Prize - see John Olsen and Tim Storrier blast judges of Archibald Prize dailytelegraph.com.au - they accused the judges of picking a "bland" portrait. He reiterated his criticism that the board of the Art Gallery of NSW had been taken over "by a postmodernist cabal" driven by fashion and political caution. in the interview he gave to the Sydney Morning Herald. That commentary makes more sense now it turns out that even pre-eminent portrait painters can feel very aggrieved about how selections are made for prestigious competitions! Storrier has very definitely for both street cred and a track record as both a portrait painter and winner of major awards. He's a previous winner of The Archibald (Portrait) Prize with his faceless painting of The histrionic wayfarer (after Bosch) (see my previous post Tim Storrier wins the $75,000 Archibald Prize 2012). He then went on to win the Packing Room Prize in 2014 for his portrait of 'Sir Les Patterson' one of the messier inventions of John Barry Humphries, AO, CBE - Australian comedian, satirist, artist, and author. His work is also included in the collections of the National Gallery of Australia, the Art Gallery of New South Wales, the Metropolitan Art Museum in New York and all major Australian art museums. I just wish he'd have a shot at the BP Portrait Award so I could get to see one of his portraits - as they are always fascinating if not a total conundrum dressed up as a portrait. You can see more of Storrier's portraits/artworks on his website. This is a video about him. 30 portraits made it through to the Finals of the Doug Moran Prize. (I like the fact every finalist wins $AUD 1,000). The finalists are a mix of well known artists and emerging artists. Venue: Juniper Hall, 250 Oxford Street, Paddington in Sydney. The Juniper Hall venue is a former gin distillery in Paddington and the oldest building in Sydney, which was fully restored in 1988 and bought by the Moran Foundation in 2012 from the National Trust. It's used as an art gallery. Tim Storrier wins Doug Moran prize for portrait of McLean Edwards | The Guardian - completely missed the interesting back story! Posted by Making A Mark on Wednesday, October 18, 2017 1 comments Who's linking to this post? 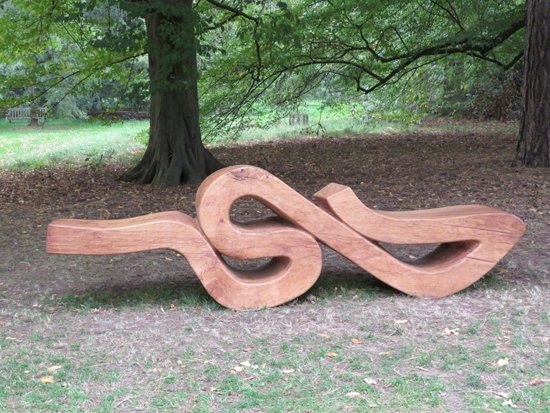 I went to Kew Gardens yesterday to view their new Artful Autumn exhibitions in the gardens. I hadn't quite bargained on getting Apocalypse Now thrown in for free! The weather was forecast to be warm and sunny and a great day to visit the gardens to see the sculpture and installations. However, we've lost confidence in the BBC Weather forecasts ever since the Met. Office lost the contract to provide the weather forecasts. We now find ourselves quite often photographing the BBC weather app showing one thing for a specific location and the weather doing something completely different. Yesterday was a case in point as the orange sun and the huge dust cloud descended on Kew as we walked around the gardens! I must confess we spent an awful lot of time just staring at the sky as it got darker and darker! four installations by four different artists in Cedar Vista. I'll touch on the Life in Death exhibition by Rebecca Louise Law later this week. Apparently it was very busy last weekend! 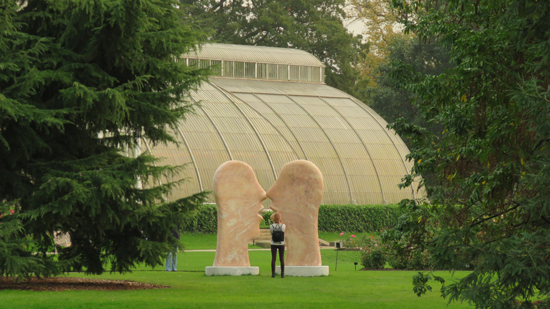 Kew Gardens is a brilliant location for a sculpture exhibition - if and when they are presented well. For me the absolute minimum is providing either an online guide or a leaflet for what you're seeing. Plus a good and uninterrupted view of the sculpture in its setting. See below for examples. It's extremely difficult to get a good clean look at the actual sculpture - unless you look at it from an angle which is not the best! Posted by Making A Mark on Tuesday, October 17, 2017 0 comments Who's linking to this post? 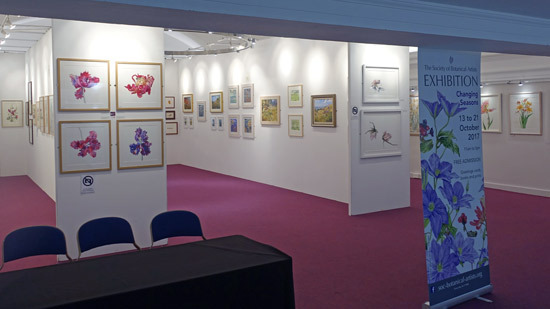 This week "Changing Seasons" the 2017 Annual Exhibition of the Society of Botanical Artists opened at Central Hall Westminster in London. Admission is free and it's on every day 11am-5pm until Saturday 21st October. In 2015 I set up my new website Botanical Art and Artists - complete with a dedicated news blog. Two years later it's beginning to rival Making A Mark for numbers of visitors and pageviews AND - according to an Alexa analysis of similar sites - is now the top website for botanical art in the world! Consequently I now focus my blog posts for the dedicated botanical art fan on that site - however I know there are a lot of fans who have not made the move over. So here for you are the my first two out of three posts about this year's exhibition. 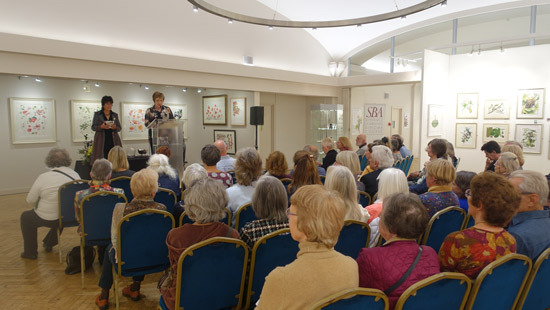 Thursday was the PV and on Friday I posted about the botanical artists receiving Awards - Society of Botanical Artists' Annual Exhibition 2017. It includes images of the artwork receiving awards and more information about the artists (links to their websites are embedded in their names). a commentary on its development over the last decade that I have been writing reviews of this exhibition. This year it includes 457 artworks covering paintings, drawings, miniatures, fine art prints and botanical ED works in glass and jewellery. So, for those of you who have been reading this week's very popular post about Watercolour paintings of flowers sell well - maybe it's time to find out what you're missing! You've got a week left to visit this very popular exhibition. Posted by Making A Mark on Saturday, October 14, 2017 0 comments Who's linking to this post? Flower paintings are hugely popular with the public. Watercolour paintings of flowers also sell well - particularly when executed by experts. I find it such a pity that leading open exhibitions of watercolour paintings (by the RWS, RI and Sunday Times Watercolour Competition) don't include more paintings of plant life in general and flowers in particular. I'd love to know why there's a dearth of flower paintings in watercolour shows - when some of the best watercolour painters in the country paint flowers! Panels of Judges who don't like, don't understand or don't rate flower or botanical paintings - and don't care what the public like! My own view is it's probably a combination of the above. This will never change until great flower painters who produce excellent work start entering the open exhibitions of other art societies and art competitions. Here are two exhibitions in London this week. The first is the Rosie Sanders: Secret Letters Exhibition at Jonathan Cooper's Park Walk Gallery just off the Fulham Road in Chelsea. (Prices are between £3,800 and £18,000). 16 out of the 26 paintings had sold when I visited on Tuesday this week. More will have sold before the exhibition closes on Saturday. This is a video of my walk round the exhibition on Tuesday this week. 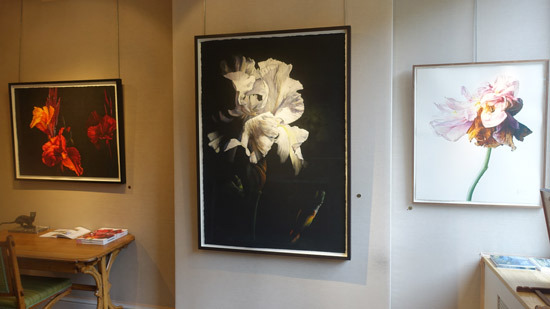 The second exhibition is Changing Seasons - the Annual Exhibition of the Society of Botanical Artists which has its Private View today and opens to the public tomorrow until Saturday 21 October. It's open every day 11am to 5pm and I'm expecting to see some excellent work. However most of these artists will never dream of showing outside group shows organised by those who understand their work. 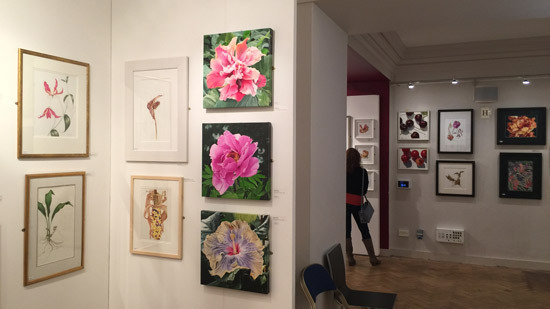 I'm off to see this exhibition shortly (it's at Central Hall, Westminster - opposite Westminster Abbey) and will be highlighting prizewinners and reviewing the exhibition on my botanical art news blog on my website Botanical Art and Artists later this week. Those who are smart can do both exhibitions in one day this week! More women artists who know how to paint what they love and sell it! Rosa Sepple (President of the RI) - Rosa Sepple sells 50+ paintings in 4 days! Jessica Shepherd - Jessica Shepherd paints leaves and sells! All the artists share an ability to understand that they have to create their own future. Others can help them - but they have to make it happen! Posted by Making A Mark on Thursday, October 12, 2017 1 comments Who's linking to this post?